One thing i notice after coming to Yangon 2 years ago: I really, really, REALLY cant live without fried rice. Why? Simply because its easy to order and also thats the only complicated Burmese word I can conjure up. But then when u have the same fried rice every single day you would start craving for something, well...a little more complicated and flavorful. Thats when Yoogane Korean Restaurant came into my life. Yoogane (Yoo-ga-ney) is technically a chicken galbi restaurant, meaning you would be served a serving of marinated chicken (in typical Korean fashion, with spicy marinades) on a hot plate but what catched my eyes were the fact that you can sort of customize your galbi with white rice and of course, the typical mozzarella cheese we Asians love so much. Fried rice with Korean marinaded chicken and cheese? I say yes, yes please. So what happens here? First you order your choice of galbi/types of meet and style of marinades, which in this case was the store's signature Yoogane's Marinated Chicken Galbi (7,800ks) with some extras for rice (2,000ks) and cheese (2,000ks). The order arrived surprisingly fast, well considering there were no cooking involved just yet. As of any Myanmar restaurants, there are at least 1 waiter for each table, in which Yoogane made sure they make full use of the waiters....they double up as cooks! I must say the waiters/cooks are really careful not to spill any meat or sauce onto us when we were there, even putting up a big metal plate around the hot plate for us. So they would cook the chicken, then the vegetables and then if you want the rice, the rice and the cheese. The whole process took less than 15 minutes which is not too bad unless you are really, really hungry....which me and my lunch buddies were at that time. The result? A bloody good mash up of flavorful chicken, rice and gooey cheese. Could do with more salt but I am good with it though you can always ask for more salt and soy sauce from the waiters. The flavorful chicken combines really well with the rice and with the addition of cheese, this dish is sure to cause serious food coma for anyone. We surely did, ordering 6 portions for 5 people (dont try this at home...). There are other sides available at Yoogane if you feel like you can handle it, in this case we ordered egg rolls (3,000ks) and Royal Court Topokki (6,500ks) which is a traditional Korean dish with rice cakes and pork. The Topokki was really one of a kind, really flavorful with the right kind of textures mixtures. Yoogane is certainly a welcomed addition to the Yangon foodscene. Price might be a bit on the higher range for most people but it's certainly a good experience for all! Oh, aprons are required by the way. 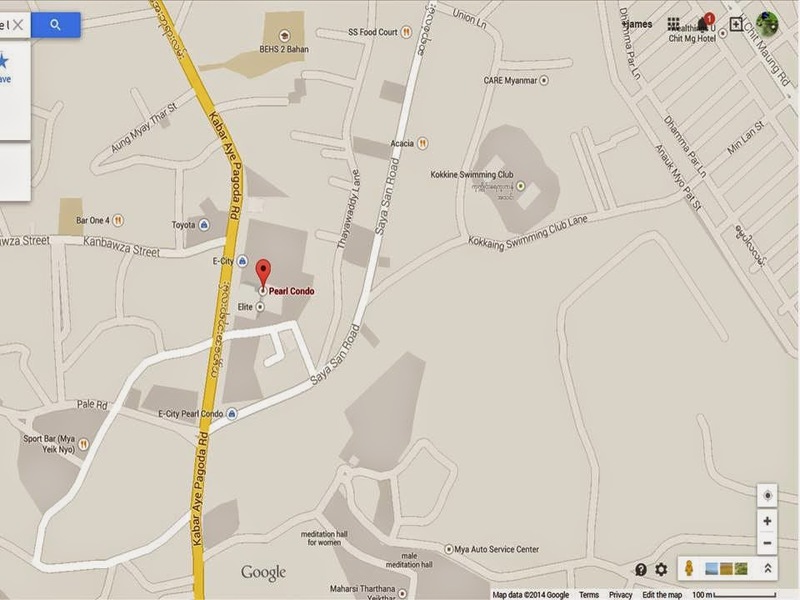 Here is a map for you readers. 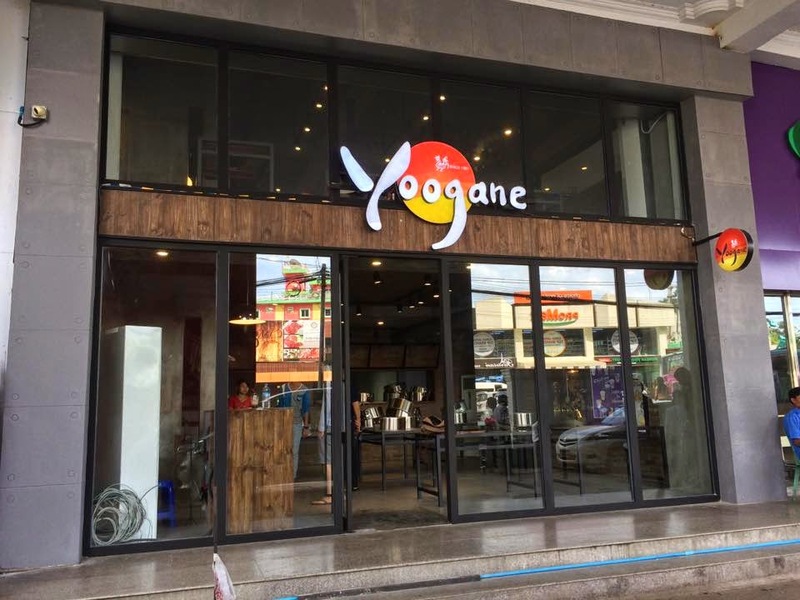 Yoogane is located at Pearl condo next to Loterria. Them Koreans sure love to hang out together. doggyjames says...much welcome addition in Yangon, word of advice: do not overorder!